So, you’re hosting a Mortal Kombat themed party, and you have your costume down pat. You’ve gotten into character and shouted at each of your friends the phrase, “Get Over Here!” But there’s just something missing, right? Well, your instinct was correct. You need this Scorpion Sword to give your Scorpion costume its….ahem, final move. Sure, it’s not quite as cool as shooting a grappling hook out of your hands, but trust us, that’s not something you actually want--what with all the messiness of your hand opening up, and where all that rope really gets stored and--you know what? We don’t need to get into that, now. 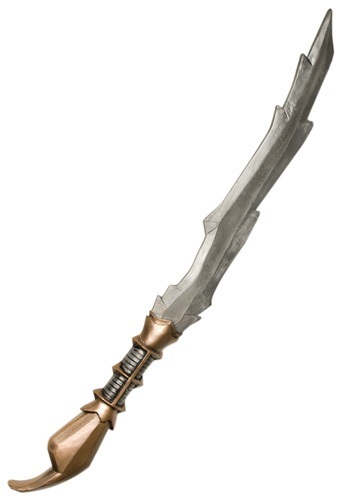 In any case, this officially licensed sword is made of plastic and comes with a grey blade and gold handle. Black grips provide a sleek look that even Scorpion himself would admire. Now, when all your friends show up, you can show off your fandom in style. Great compliment to the scorpion costume. Ready for Halloween!